This system includes Carolinas Hospital System Marion (formerly known as Marion Regional Hospital and Marion County Medical Center), licensed for 124 beds; Mullins Nursing Center, a 92-bed long term care facility; and nine physician practices and clinics. 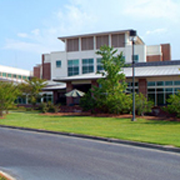 The main hospital, built in 1997, and two medical office buildings, are situated on 133 acres on Hwy. 76 in Marion, a community of just over 36,000 people. Mullins Nursing Center is located five miles away in Mullins. Mullins takes pride in the diversity of recreational opportunities available in and around the city. The City of Mullins has a year-round recreation program with a full-time director and 3 staff employees. Mullins is home to the Gapway Recreation Complex and Miles Recreation Center. Mullins takes pride in the diversity of recreational opportunities available in and around the city.